After working almost ten months at Save the Harbor as an Environmental Policy Intern, I'm ready to take my work out of the office and into the harbor as a Senior Harbor Educator! 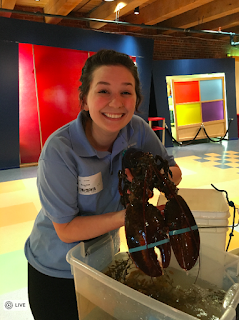 This is an exciting new role for me, and I'm really looking forward to the opportunity to help kids learn about Boston Harbor, it's history, and the great little critters that live inside it. Hangin' out with my good pal Larry the Lobster! Last May, I earned my Bachelor's Degree from Clark University in Environmental Policy, where I focused on water quality and sustainability, as well as classical clarinet performance (gotta have a little variety, right?). When I began my internship, I was very focused on water quality, but quickly discovered I was interested in youth programs and environmental education. I spent the winter working with some of the other interns on developing a summer program curriculum guide, which aggregated our existing curriculum resources with some new programs. Personally, I think it turned out great and I can't wait to watch it come to life this summer! I'm so grateful that Save the Harbor has taught me so much about Boston Harbor and what an awesome resource it is, both as a hotspot for recreation and a laboratory for learning. I can't wait to share what I've learned with Boston's kids and families!